Norfolk has its giants: Cley, Salle, Cawston, Ranworth, the Marshland churches, not to mention the big town and city churches; but I love the little lost out-of-the-way places, and the atmosphere you get in slightly shabby, relatively untouched and unvisited churches like Cranwich, Beeston and Little Witchingham. And here, at Hardley; as with the other three, the setting helps. The long, narrow lane from Chedgrave to nowhere peters out here, on the edge of the marshes. Beyond, for miles, are the flat grasslands with their scatterings of sheep; the long, lazy Yare winds through, going eastwards eventually, but in nothing of a hurry. And the silence; just the wind in the reeds far off, like something that happened long ago. A row of council houses opposite the church seems slightly incongruous, but not inappropriate for this working landscape. 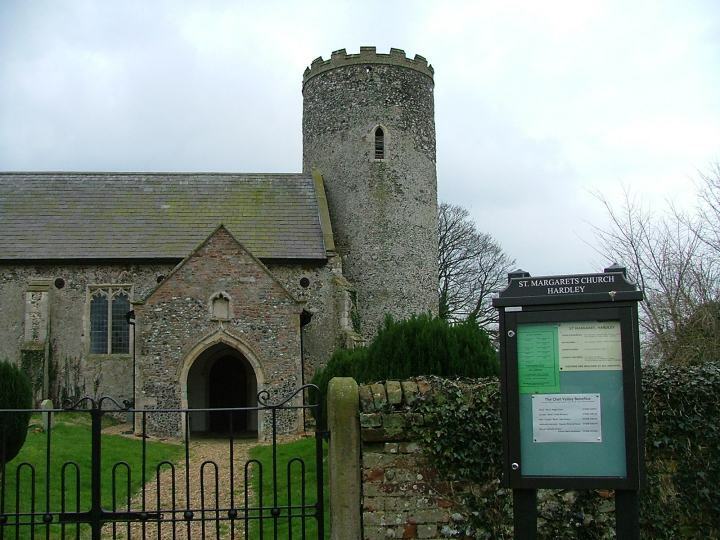 Unusually for these little Norman churches in the marshes, St Margaret had an extensive makeover in the late 15th century, and was then well-kept by puritans in the 17th century. The Victorians virtually ignored it. As a result it is full of white light, even on a winter's day. The one major addition of the 19th century is, in any case, delightfully quirky, a little red-brick vestry with an oversized chimney to the north of the chancel. The body of the nave is off-centre against the fat round tower - Pevsner thought an arcade had been knocked through into the aisle to increase the size of the nave, which may have happened in the 17th or 18th centuries. The font, typical for this part of Norfolk, sits on a high double pedestal, the pretty painted pipe organ behind. On the south wall, facing the door, is a St Christopher, not as big as some round here; the background pattern is like ermine. Beside him, a marshland heron looks up, and between his feet fish squirm in the river. Beside him is an earlier, smaller St Catharine holding her wheel, possibly the site of a former altar. Much of the screen is renewed, but there are some parts which are clearly original, including a very wise face on one of the medallions. The sanctuary is plain and simple, with a seemly piscina; the perpendicular east window is curtailed from below. A brass to the splendidly named Drake WIlliam Playters is wholly secular. The Playters were from Sotterley in Suffolk, and as the brass reminds us, Drake WIlliam married into the Tollemaches of Helmingham. We may assume that he wasn't short of a few bob.